North Ridge > summit > East Ridge > Tie Tr > North Ridge | 11 mi. | 2600′ ele. gain | 5:30 hr. Today was the last training hike before our team’s South Sister hike later this month. I connected the longest loop I could imagine on Marys Peak so we could get some mileage in today! This loop connected both the North and East Ridge Trails via the Tie Trail, a seldomly used footpath that traverses the mountain. 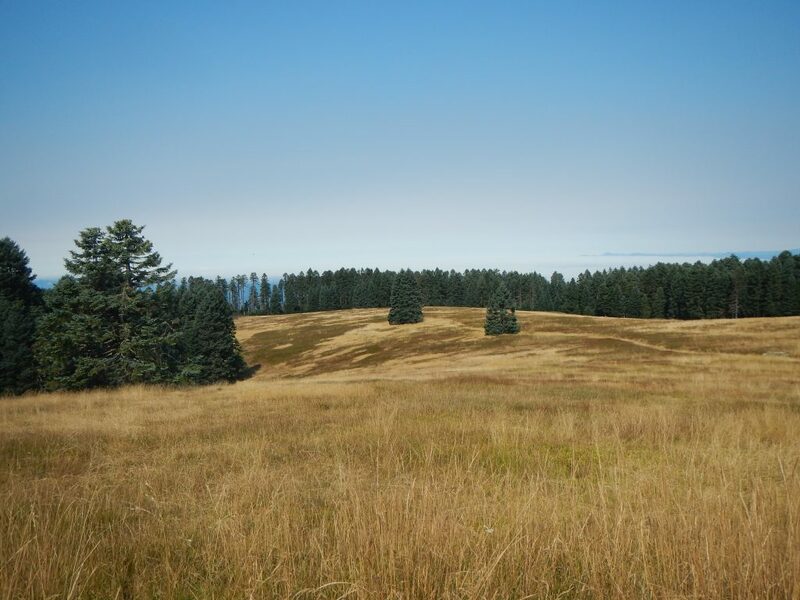 This would be my fourth time on Marys Peak this year, so I was starting to feel pretty familiar with the lay of the land. The North Ridge was quiet. The forest was a mixture of brown and green. We hiked along at a pretty solid clip, passing a variety of flora: sword fern, sorrel, salal, Douglas fir and vanilla leaf (among many others). We knew it was sunny outside but we didn’t feel much of it below the thick forest canopy. It was only after we reached a little clearing near the summit road that we began to see sunbeams reaching down to the forest floor. In just over an hour and a half we reached the road and a giant, empty parking lot. A strange sight at 11 am on this gorgeous summer day! The golden meadows around the lot looked ready for the rains of autumn. 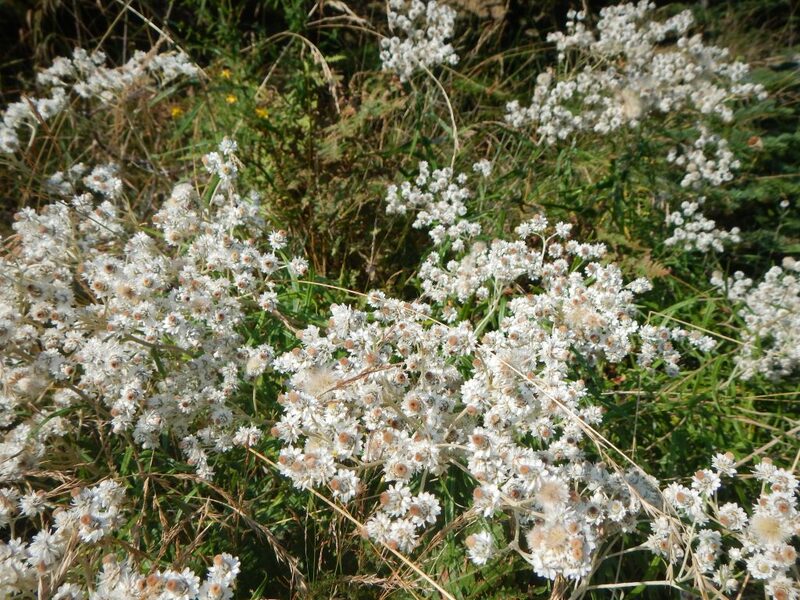 We hiked up the road to the summit, observing pearly everlasting and a handful of late flowers still blooming. We ate lunch in view of the scenic summit radio tower, replenishing our Vitamin D stores as well as our calories. The return hike was a bit of a trudge. We jogged down the East Ridge and picked up the Tie Trail, which clearly did not get as much foot traffic as the other trails. The ups and downs made it feel twice as long as it actually was, but before too long we were back to the junction with the North Ridge. It felt like a good time for one last snack break before making our final descent. We wandered down, feeling small beneath the Douglas fir, enjoying these last few glimpses of the woods. Today’s hikers were strong and well-prepared, so I hope that South Sister presents no big surprises! 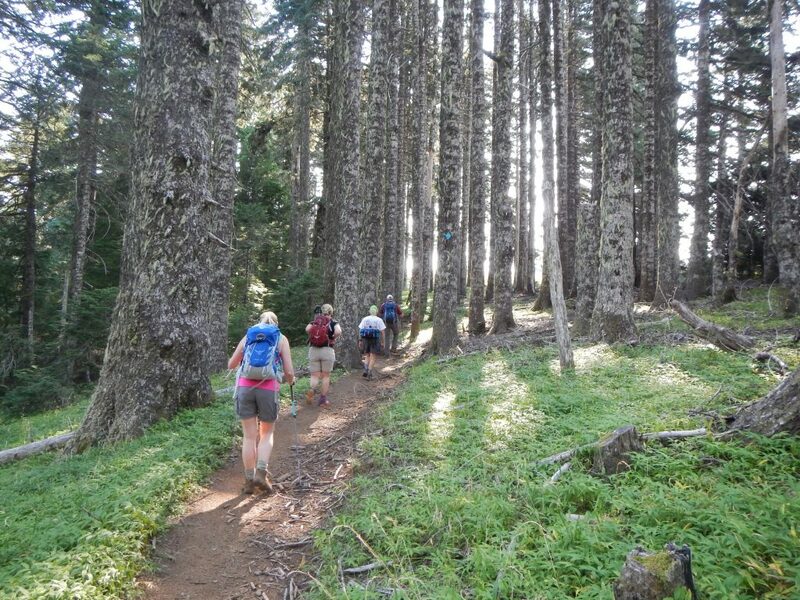 This entry was posted in Hiking, Oregon and tagged hike366 on September 8, 2014 by Jess B.